Feel the magic with the splendor of this remarkable & stunningly beautiful hand-made Krishna Radha artwork from India. 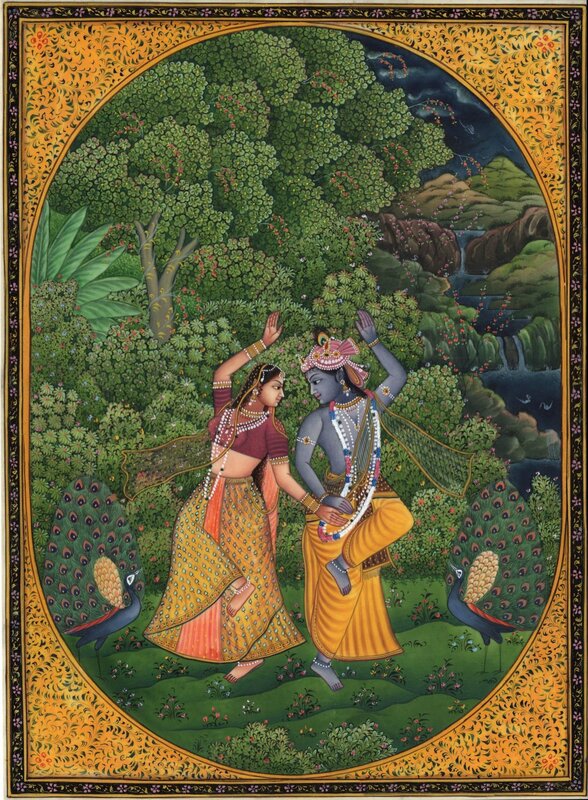 This painting is an exquisite work of art that depicts an ecstatic union of the spiritual lovers, Krishna and Radha, engaged in a cosmic dance. The painting ensures that the viewer along with the watching peacocks are all swept up in the current of the Cosmic Dance. Set against a backdrop of the flowing river and a colorful landscape, the artwork is a medley of Hindu mysticism, eternal love and blessings of mother nature. It will make a superb display in your home or office for a brilliant showcase of fine artistry and you are bound to get many compliments even as Lord Krishna brings a festive touch to your decor. Buy this exclusive Krishna Radha painting now and experience some of the divine musical bliss in the presence of this magnificent work of art.